I cannot participate, but would like to support the MCHS Golf with a tax-deductible donation. Sunday, October 15, 2017 at 10 a.m.
All youth golfers are welcome to play in this fun golf event. It is played Ryder Cup style so good for all levels of play. Fee includes tournament green fees, lunch and raffle ticket. Sunday, October 15, 2017 at 1 p.m. Enjoy a fun day of golf while fundraising for the boys and girls golf teams. Fee includes tournament green fees, fiesta happy hour and drink ticket. Sponsorships and Silent Auction also available. Non-golfers are welcome to join us for ​Happy Hour only for $50, includes drink ticket, register via tournament link. Support the team with a tee sign. Large ($500) and Small ($150) sizes available. Promote your company or send well wishes to your favorite golfer. Register by October 7th to allow time for personalization. 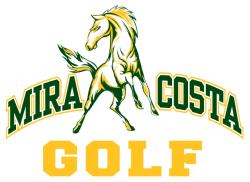 As a Magnanimous Mustang donor you will receive your name and logo on event signage and website; recognition at the lunch and happy hour; and one golf foursome in the adult tournamnet including four beverage tent tickets. Register by October 7th to allow time for personalization.